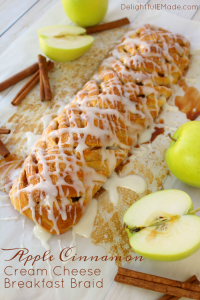 An amazing breakfast braid recipe perfect for fall! 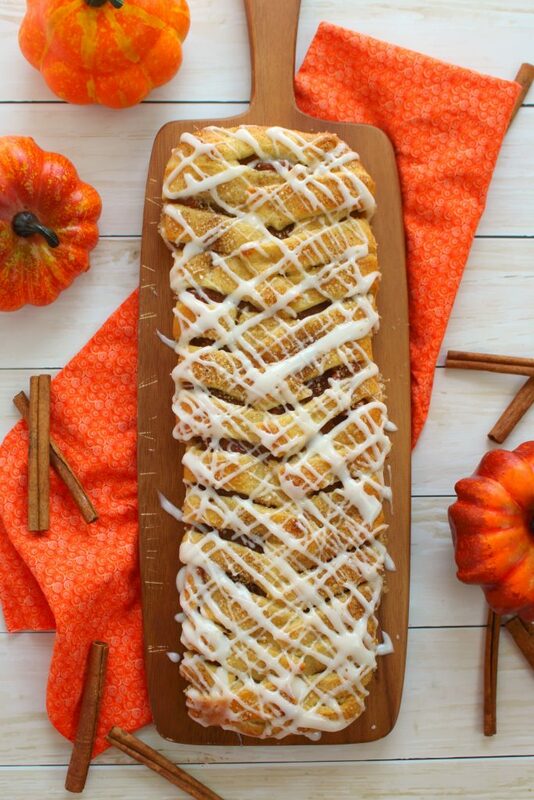 You’ll never believe how easy it is to make this Pumpkin Cream Cheese Breakfast Braid recipe! Made with refrigerated crescent roll dough, and a few other ingredients, this gorgeous pumpkin pastry will look like you bought it at a fancy bakery! Is your favorite season autumn? Yes, me too! I was just talking about this with my son, and why we don’t have to be sad about summer being over. 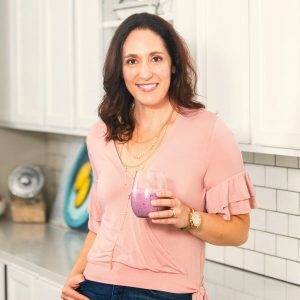 Yes, we do love the lazier days of summer, but it has nothing on the cool, crisp air, the beautiful changing of colors in the fall foliage, and best of all – the amazing flavors of fall. 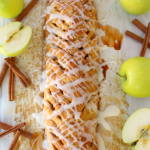 I absolutely adore the cinnamon spices, the fantastic honey crisp apples, and best of all pumpkin everything! 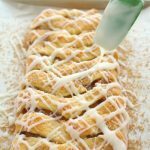 These amazing flavors of fall are what inspired me to make this amazing Pumpkin Cream Cheese Breakfast Braid recipe. 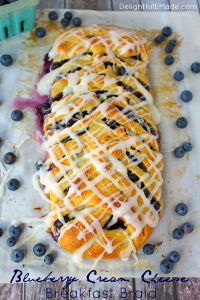 Similar to my Apple Cinnamon Cream Cheese Breakfast Braid, and my uber popular Blueberry Cream Cheese Breakfast Braid, this pumpkin version is also super simple to make. It starts with store-bought crescent roll dough, layered with pumpkin pie spiced cream cheese, and filled with pumpkin puree. 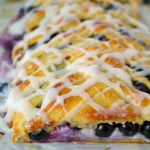 It not only makes for an absolutely beautiful braided breakfast pastry, but its perfect for a fall breakfast treat! 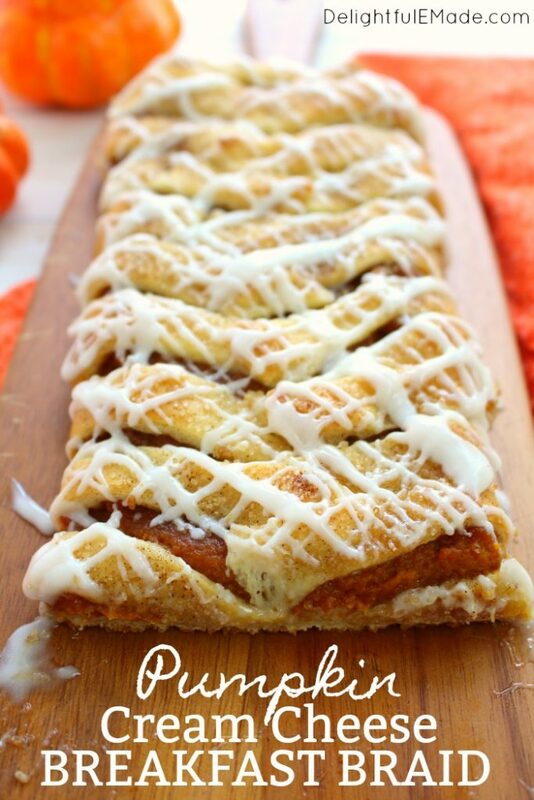 The secret ingredient to making this pumpkin breakfast braid easy to make is the store-bought crescent dough. You’ll start by unrolling the dough onto a sheet of parchment paper. If the dough is perforated, simply pinch and pat the seams together. If available, look for non-perforated sheets of crescent dough. 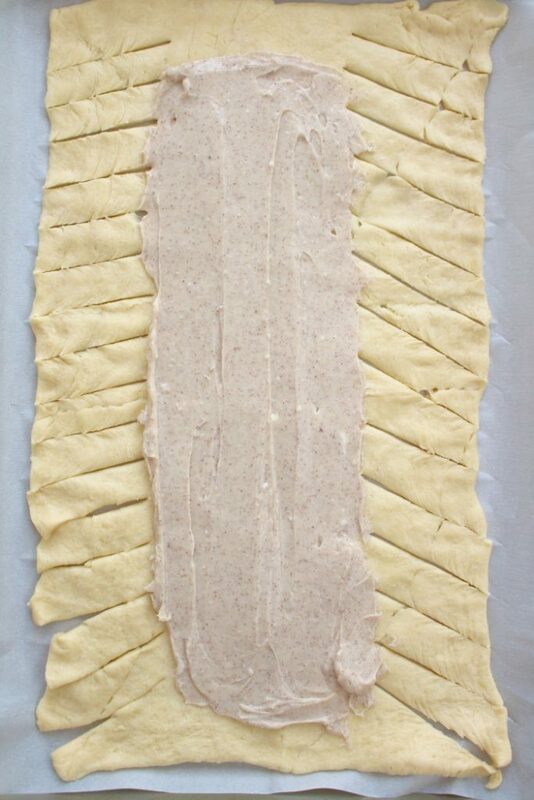 Next, on the longer sides, begin cutting 4″ diagonal strips of dough. These strips will act as your “braid”. However, don’t worry about braiding the dough – you’ll only be folding each side over the other, making a simple cross-hatch on the top of the pastry. In a small bowl, combine the cream cheese, sugar and pumpkin pie spice. Then, spread the cream cheese mixture in the center of the dough. Leave a 1″ space at both ends of the dough. 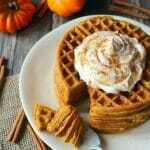 In a small bowl, combine the pumpkin puree, sugar and pumpkin pie spice. Stir together to combine. Then, evenly spread the pumpkin mixture over the top of the cream cheese in the center of the dough. When the breakfast braid bakes, the pumpkin and cream cheese will bake together to create a wonderfully creamy pumpkin filling! 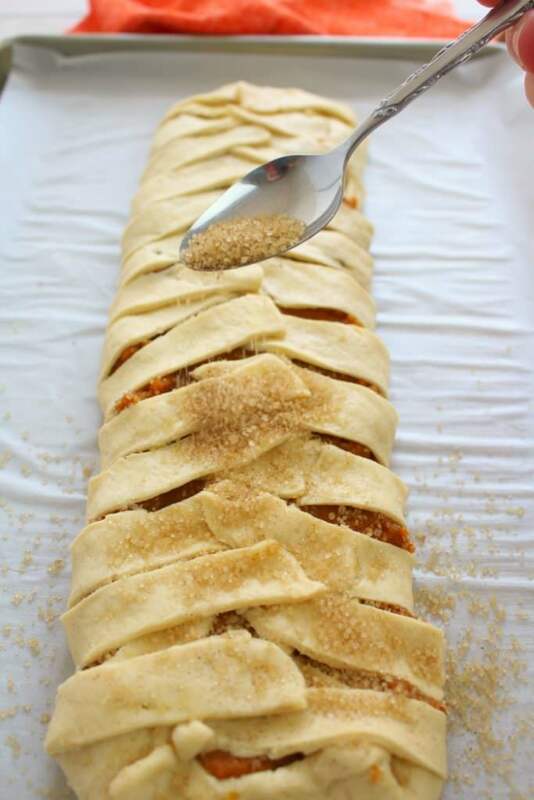 Once the cream cheese and pumpkin filling is in place, you will then begin to fold the dough over to close up the pastry. Start at each end, folding the top and bottom over the filling. Then, fold each strip into the center, alternating each side. Like I mentioned earlier, you’re not acutally braiding the dough, simply just creating the appearance of a braid. The strips will simply lay over the top of each other. It most definitely does NOT have to be perfect. 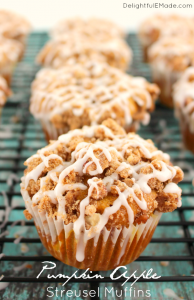 This is probably one of my favorite additions to this breakfast braid recipe! In a small bowl, combine turbinado or raw sugar, and pumpkin pie spice. Then sprinkle over the top of the pastry dough. 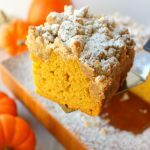 Not only does the sugar and spice topping create a wonderful crunch to the pastry, it helps give the dough a beautiful golden brown color once it bakes. If you don’t have access to turbinado or raw sugar, feel free to use granulated sugar. The turbinado or raw sugar granules are a bit larger, and simply add a bit of extra texture to the dough. Once the sugar goes on the top of the dough, it can go right into the oven. Bake at 375 degrees for 15-18 minutes or until dough is golden brown. While the breakfast braid is in the oven, its a good time to mix together the glaze. The cream cheese glaze is very simple – just three ingredients; powdered sugar, cream cheese and milk. 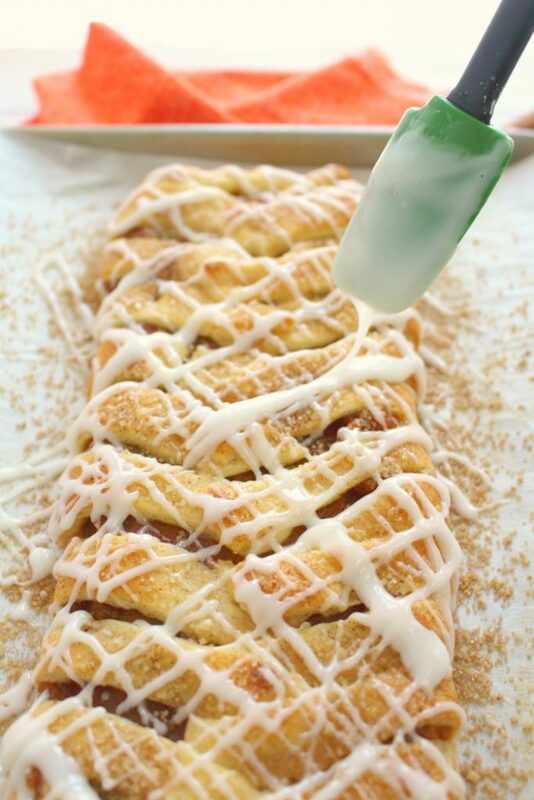 Once the pastry comes out of the oven, and while still warm, drizzle the breakfast braid with the glaze. 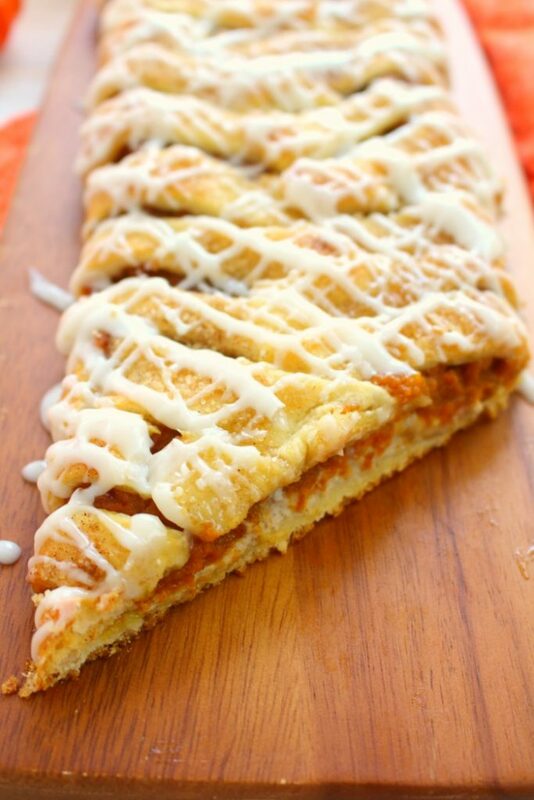 It adds the perfect amount of sweetness to this wonderful pumpkin pastry. 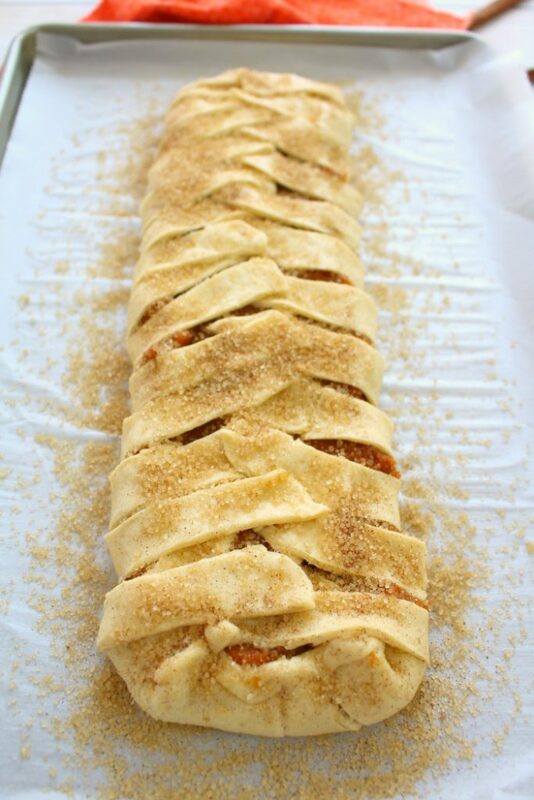 While still warm, slice the pumpkin breakfast braid into strips and serve. 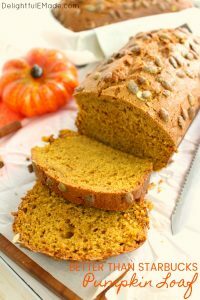 It’s fantastic for a fall weekend breakfast, and great for brunch on a crisp autumn day! 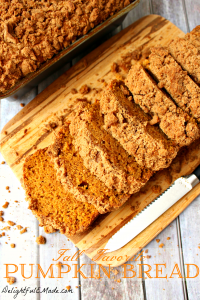 This pumpkin breakfast pastry is a fantastic treat for the teachers at your kids school, and your office mates will think you’re amazing after you bring this in to work for a morning treat. 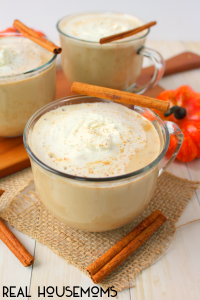 Amazing with a psl, or better yet, my White Chocolate Pumpkin Spice Latte! 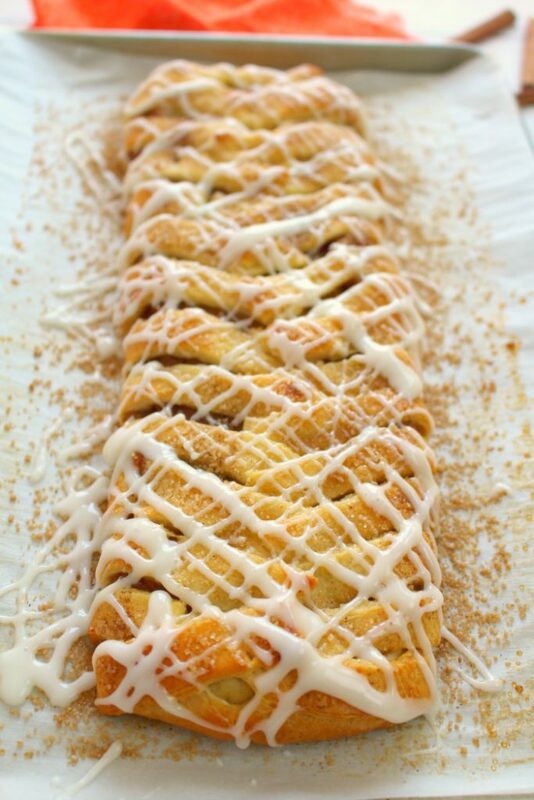 You'll never believe how easy it is to make this Pumpkin Cream Cheese Breakfast Braid recipe! Made with refrigerated crescent roll dough, and a few other ingredients, this gorgeous pumpkin pastry will look like you bought it at a fancy bakery! In a bowl, cream together the 4 oz. of cream cheese, 2 Tbsp. of sugar and 1/2 tsp of the pumpkin pie spice. Spread into the center of the dough, leaving about 4" on each side. 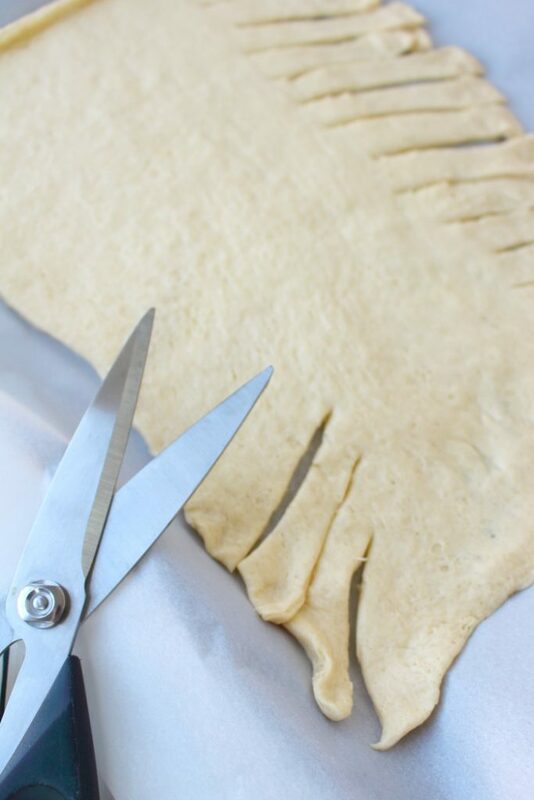 Using kitchen shears or a knife, cut diagonal 1"strips along the sides of the dough. In a bowl, add the remaining 2 Tbsp of sugar, pumpkin puree, and 1/2 tsp. 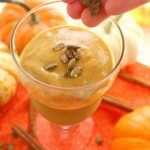 of pumpkin pie spice and mix together. 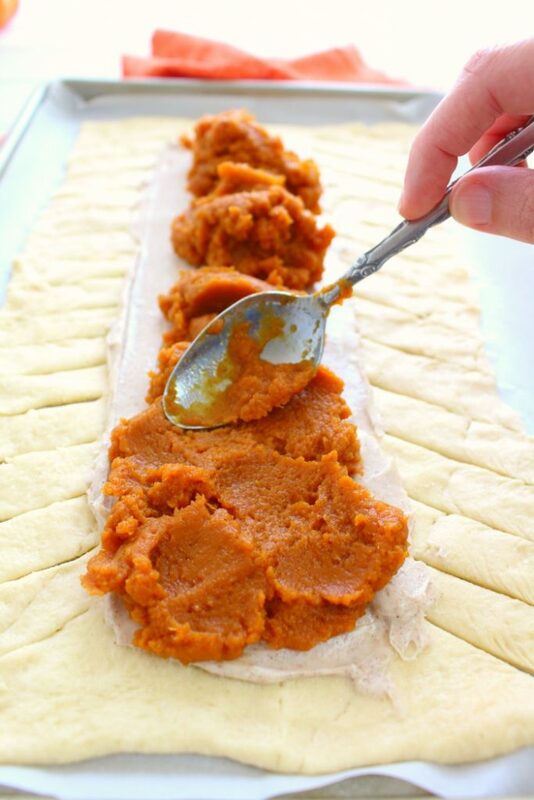 Evenly spread the pumpkin mixture over the top of the cream cheese area of the dough. Gently fold over each end of the dough on to the top of the pumpkin. 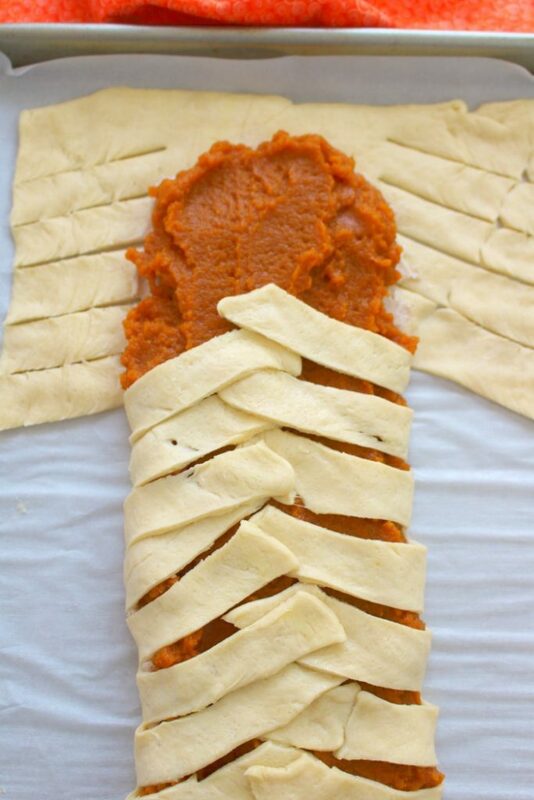 Then fold over the strips of dough, alternating with each, folding over the dough until all of the pumpkin is encased. In a small bowl, stir together the turbinado or raw sugar granules with the remaining 1/2 tsp of cinnamon. Sprinkle the sugar mixture over the top of the pastry. Bake at 375 for 15-18 minutes. 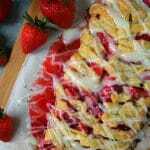 While pastry is baking, mix together the glaze by creaming together the powdered sugar, cream cheese, and milk. Mix until smooth and consistency is thick, but able to drizzle with a spoon. If you cannot find turbinado or raw sugar, granulated sugar works just as well. The only difference is that turbinado/raw sugar granules are larger and work well on top of a pastry. Just add a cup of coffee and it's a lovely morning treat! Thanks for sharing at the What's for Dinner party. Can't wait to see what you'll bring next week! Have fantastic day!